Dac-Nhuong Le obtained his PhD in computer science from Vietnam National University, Vietnam in 2015. He is Deputy-Head of Faculty of Information Technology, Haiphong University, Vietnam. His area of research includes: evaluation computing and approximate algorithms, network communication, security and vulnerability, network performance analysis and simulation, cloud computing, IoT and image processing in biomedicine. He has authored 4 computer science books and has multiple research articles in international journals. 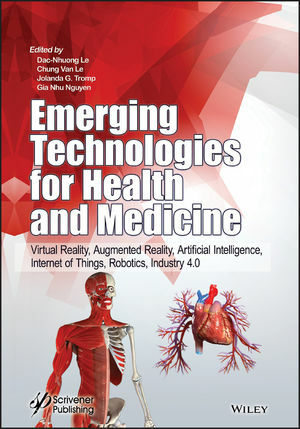 Chung Van Le is the Vice-Director at the Centre of Visualization and Simulation and Lead Software Developer for 3D virtual body system for teaching anatomy and virtual endoscopic techniques for medical students at Duy Tan University in Vietnam. Jolanda G. Tromp is a VR/AR/AI/IoT Human-Computer Interaction expert for user-centered design and evaluation for new technologies, with 20 years' experience as a principal Usability Investigator. She has a PhD in Systematic Usability Design and Evaluation for Collaborative Virtual Environments, 2001, University of Nottingham, United Kingdom and a BSc in Psychology (with honors) from the University of Amsterdam, Holland. She is a research consultant for the Center of Visualization and Simulation and the Duy Tan University, Vietnam; for the Mixed Reality Task Group of the State University of New York; and for the Global Simulations Working Group. Nguyen Gia Nhu, received his PhD degree in computer science from Ha Noi University of Science, Vietnam National University, Vietnam. He is now the Vice Dean of Graduate School at Duy Tan University. He has more than 40 publications in reputed international conferences, journals and book chapter contributions. His research interests include algorithm theory, network optimization and wireless security.